On the Center Link of a 3-Point hitch, there are 3 different spots where you can attach the pin to hold the implement in place. I asked my 65-year old dad, and he said, "Always use the bottom one." Well, hell dad! If we're always supposed to use the bottom one, then why did they put 2 more holes in there? No, it wasn't for ^^ that ^^. To compound my confusion, now comes along this Boom Pole that has a 3-position spot on the implement end. Can someone explain to me why there are all of these different positions? Using the different holes allows you to adjust your implement height or depth a bit more. If I'm thinking right, you put it in the bottom hole of the tractor to lift the implement higher. Most people I know just use the others for holding spare pins (like a spare to connect a hay wagon). On that boom pole, the top and bottom holes are the same diameter. Again, it gives you the capability to lift it higher if you use the top hole. The middle hole is different so it can be used for both CAT-1 and CAT-2 connections. The bottom hole tips the implement more toward the tractor as it rises. You probably want this for a disc, rototiller, etc where you need ground clearance to carry the implement. In contrast, using the top hole will keep the implement more level as you raise it. One application where you might want this is rear forks lifting a pallet or a harvest bin. (But it will still tip inward somewhat). If this is hard to remember, then imagine if the top link were connected down at the same level as the lower arms. Obviously that would tilt the implement extremely as it rises. You didn't tell us what kind of tractor you have, but if it has draft control, the different positions may affect the draft control sensitivity. On my Kioti DK45SE, for example, the top position is used for implements which do not need draft control; the middle position is for implements needing a heavy draft to affect the control, such as a plow, box blade, or most other ground-engaging attachments; and the bottom is for implements needing a more sensitive or lighter draft control, such as a cultivator. Draft control is used to automatically raise or lower the implement as it encounters obstructions such as rocks and roots. The most traditional use for it is in plowing. 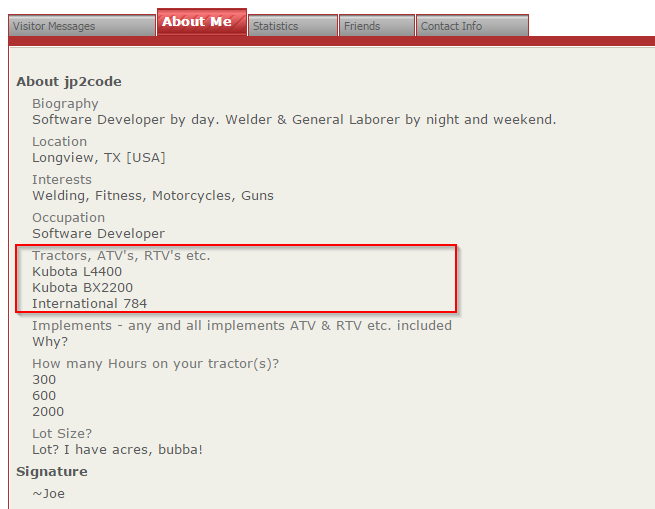 When I filled out my profile, it had me put in my tractors. I wonder what the purpose of that is if it doesn't display it along with my posts? I don't do much cultivating. Most of what I do is brush cutting or post hole digging. I'm looking at getting a boom pole to help me haul/drag stuff around. For a time, I had been looking at getting a rotor tiller for the sole purpose of busting up bamboo roots. I have been told, however, that a rotor tiller would just jam up on those roots and I'd spend more time digging the roots out than I would tilling them out of the ground. Sorry, I usually don't even think of looking at the profile. I guess I'm used to forums that do display what tractors you have. I would look in your operator manual for each tractor, which should give some idea of the purpose of each hole. If you don't have a manual for your 784, the Red Power forum may be able to help you. For brush cutter, post hole digger, or boom pole, I would usually use the top hole on my tractor, In fact, I haven't used anything else yet, since most of my work is mowing and I have a quick hitch installed.